A wren couple built their house on the porch of our place in the country and for weeks we've had the pleasure of watching reality bird show: nest, little blue eggs, fuzzy wrenlets, wrenlets with feathers. When we went up this weekend, however, we were surprised that birds were still there--the babies are so big now that their wings flop out if the nest. 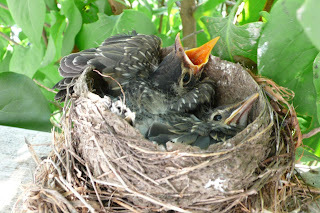 So we got the opportunity to learn how a mother bird gets her grown offspring to fly the coop-- she stops enabling them with the food deliveries, instead keeps her distance, chirping encouragingly from a branch nearby until they finally summon the courage to try their own wings. No boomerangers allowed. Mother knows best. As in Mama bird and Mama Nature.